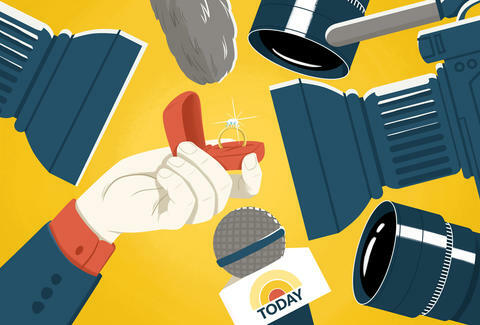 I Proposed to My Fiancé on the 'Today Show.' This Is What Happened Behind the Scenes. This past Christmas, Todd Cochran surprised his girlfriend Mallory Walsh with three hours of engagement ring shopping at the mall near his parents’ house. 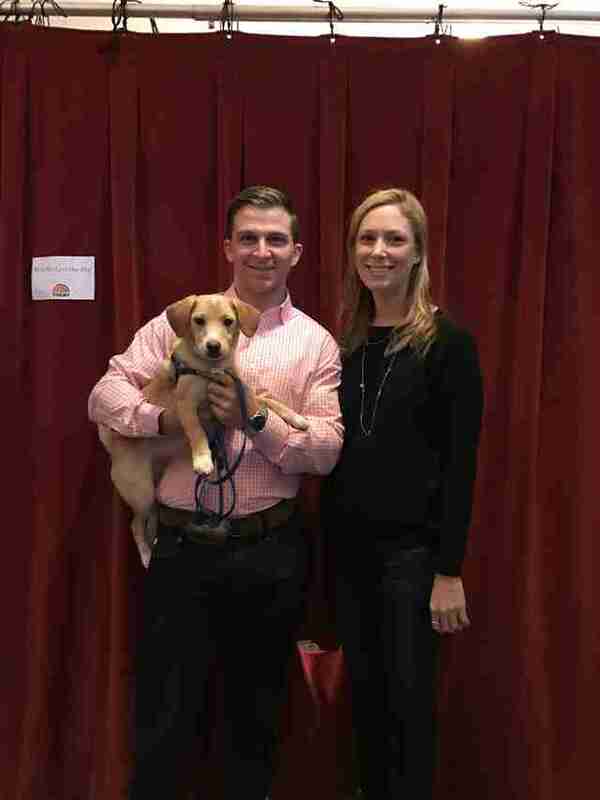 Less than two months later came another, much bigger, surprise: Todd got down on one knee on the Today Show to propose to his girlfriend of four years in front of a television audience of millions on Valentine’s Day. This is his story of what went down behind-the-scenes. I’ve always been a fan of grand gestures for momentous occasions, and my girlfriend Mallory is self-admittedly easy to surprise. So when I saw a Today Show segment with Al Roker saying something along the lines of, “If you’re getting ready to propose, reach out to us and we can make it extra special,” I knew I had to do it. Mallory knew a proposal was coming -- we’d already visited ring stores together and I’d put down a deposit for one. I wanted our friends and family to be a part of the proposal in some way, and we’re both fans of the Today Show, so it seemed like the perfect way to pull it off. After seeing the casting call, I filled out their online questionnaire, which asked for photos of us together, a brief overview of how we met, and a plan for how I wanted to propose. They had a 500-character limit, which I easily maxed out. The proposal plan that I had was very intricate -- but the producers had a whole other agenda. After two weeks of no news, I assumed we weren’t the lucky couple. But then the producers called me to verify my information and ask for more photos. Another week went by before they called again, this time asking for a detailed presentation of how I wanted to propose. They also wanted to know whether or not I had any felony charges: I said no, and they let me know that they were going to do a background check so I shouldn’t lie. A day later, after my background check had cleared, the producers confirmed we’d be on the show. This was a week before Valentine’s Day (the date of the on-air proposal) so there wasn’t a ton of lead-time. And there was plenty of planning to do from there. My original proposal plan involved a restaurant that we really like next to our first apartment, called The House. I planned to reserve a table on the top floor. After dinner, a scrapbook filled with memories would have been delivered by the server like a dessert menu. I would have been like, “Oh man, this isn’t the dessert menu!” and after she saw that first page I would have proposed. All her friends would have been waiting on the bottom floor at the bar to celebrate with us. But, of course, the Today Show producers already had a proposal in mind. Today’s main idea was to have hidden cameras set up around our apartment so that on the day of the proposal, Matt Lauer would end the preceding segment with, “This next segment is for Mallory Walsh. Mallory this is very important, I need you to go open your front door right now.” We’d have had her go to the front door, and Al Roker would be standing there with our families in the stairwell. I would have been in the apartment on one knee -- and then I would have proposed right there, in our apartment. They wanted me to have Mal dressed and camera-ready by 8:05 in the morning. Sharp. That meant the show would have had to come in at 5am to set up the hidden cameras -- and they wanted to make sure that neither of us were naked on camera that morning, which, I was told, would have been an FCC violation that would cost them thousands of dollars. I gently tried to steer them away from this plan for a lot of reasons. We’re not going to live in that apartment forever, and I want to be able to go back to the spot that I proposed in, but they were really into it. Once the technical team realized there would be a seven-second delay from the studio to our TV screen -- an eternity in the world of live TV -- the producers had to (thankfully) ditch this plan. I’d be in the park, with all our friends and family, and proposed right there. The producers would need to get permits to film in the park, shut down the road to get all the equipment there, and figure out how to get Mal in the park by 8:17am on the dot (due to the show’s strict scheduling). They wanted to take her to the park in a horse-drawn carriage, and though it sounded over-the-top, I knew by now that it was the producers’ plan or bust. But then there was a big snow and ice storm the weekend prior to the taping. Obviously, snow in New York tends to get gross within a day, so that plan had to get scrapped and we had to scramble really quick. Finally, I shared my own idea for a segment called “Love Your Pet on Valentine’s Day” in which Today would have pet owners talking about why they love their pets. After that, I definitely had a few moments of, "Am I sure I want to go through with this on TV?" It wasn't cold feet per se, but I wanted to be considerate of her feelings. The night before the proposal, one of her best childhood friends even tried to talk me out of it. She was more nervous for Mallory than she was for me. Eventually, I sold Mal on the fake pet segment, convincing her how much fun it would be. To make it all seem legit, I showed her another fake email with the “Love Your Pet” segment details. That ended up being super nerve-wracking when she asked why I was just showing her the email on my phone and not forwarding it to her. That night, she kept asking if this was a hoax, so I had to continue to sell our appearance pretty much until they sent us a car early the next morning. When we arrived on set the morning of the proposal, the Today staff quickly shuffled us into a room to make sure Mal didn’t notice there were no other pets there, and so that she couldn’t see the screens, which were alluding to a proposal pretty much the entire morning. Our friends and family were also on the plaza (the show put our parents and siblings in a hotel the night before). Mallory turned to me and kind of screamed, “You can’t hold it? !” in front of the producers and cameraman. I said, “No, I’m so nervous. I’ve gotta go.” But before we could even argue about it, one of the producers pulled me out of the room. Outside, the Plaza was decorated with a pink carpet, flowers, and balloons. The producer hid me behind our families, so that when Mallory walked out, I would emerge from our families and greet her at the carpet. As this was going on, a separate cameraman was with her and our puppy, filming what they called the “keystone segment,” with Al Roker chatting with Mallory about the Valentine’s Day pets segment. He is not good at small talk, by the way, and was buying time in a terrible way -- I guess he was just as nervous as we were. Meanwhile, a segment about the upcoming proposal was actually airing on TV. Even though she protested that I was still in the bathroom, Mal followed Al Roker out towards the carpet. Distracted by Irving trying to eat all the flower petals on the ground, she didn’t immediately realize what was going on. When she saw my sister, she just assumed she was surprising us for the dog segment, but then she started to see everyone else -- including one of our friends holding a sign that said, “TODD AND MALLORY FOREVER.” That’s when it hit her that this may not be a dog thing. The producer swore to me that if I stumbled over my words or blacked out and just blurted out the proposal she would be very upset with me. The night before, I rehearsed for a solid hour at the dog park. When it actually happened, I got about 90% of what I wanted to say out -- I think I missed some nuances -- but I made sure the delivery was meaningful and as loving as I wanted it to be. After she said yes, Roker pulled us aside to chat with our families (he also stepped on Irving’s paw -- so awkward). The next minute was kind of a blur -- they gave us a surprise trip to Puerto Rico as a gift and then took us back inside and we were officially engaged. I’m still kind of waiting for Mal to get mad about the whole thing. I’ve thought a lot about of whether proposing on live TV was worth it. Mal never asked for this, or anything close to it. In fact, she later told me, “If I had any inclination you were going to do it, I would have freaked out.” But the proposal was an incredible memory that will be part of our lives forever, so I don't regret it at all. Melissa Kravitz is a writer living in NYC. She was once on the Today Show but not proposed to. Follow her on Twitter.